The Return of Go-Slow-Sunday – Run. Ride. Roam. Where oh where has my little tent gone? Oh where oh where can it be? So we can pitch our tent again! We awoke this morning to an almighty rumbling, flashing and pelting! A storm had arrived and it wasn’t happy, it was loud and shouting and noisy and angry and the rain poured down and the sky lit up and the thunder roared and growled. We stayed in our room, looking out the window, checking…checking…checking for the time when the storm would pass and we could set off ridIng, even if it meant getting wet. Wet would be OK, lightning not so OK. Finally, it eased and stopped, so we got off to a later than usual start and rode off into the rapidly warming, hazy and muggy day. The town was so quiet, it was like I remembered Sundays being once upon a time, before everything was open seven days a week and streets were busy all the time. It was a really nice, peaceful ride through the little town. We had our numbers written down again, to follow the cycle network, playing our “bicycle bingo” waiting for our number to come up on a sign and then following it. We rode along beautiful quiet roads and cycle paths again and through that splendid countryside that we have fallen in love with. We came to a split in the path, beside a motorway. There was a path up ahead with what looked like a bridge to cross the road and another path that took us down below it. As we stopped to check which way we should go and discuss whether the high road or the low road would be the right way, a road cyclist came along the lower path, stopped and asked us if we needed help. 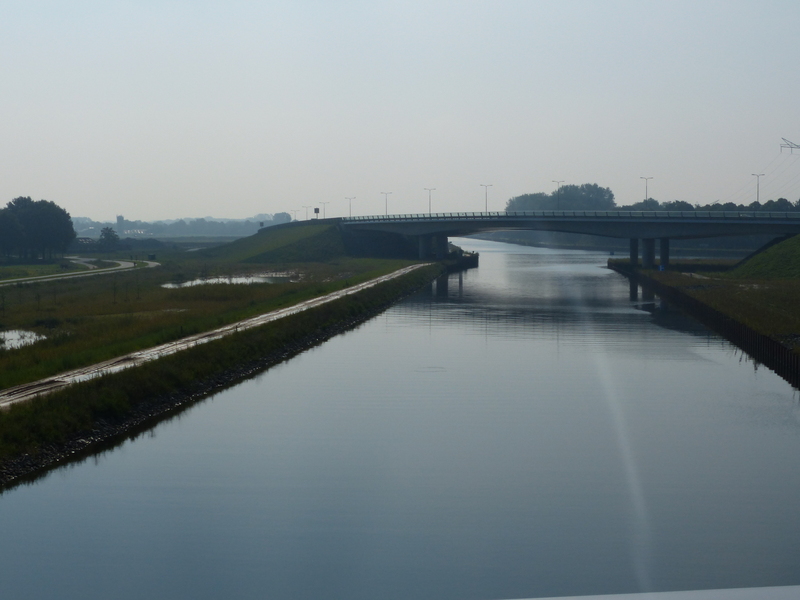 Again, we apologised for not understanding his Dutch and, as everyone seems to do so graciously, he switched to English and asked if we were heading for Den Bosch. 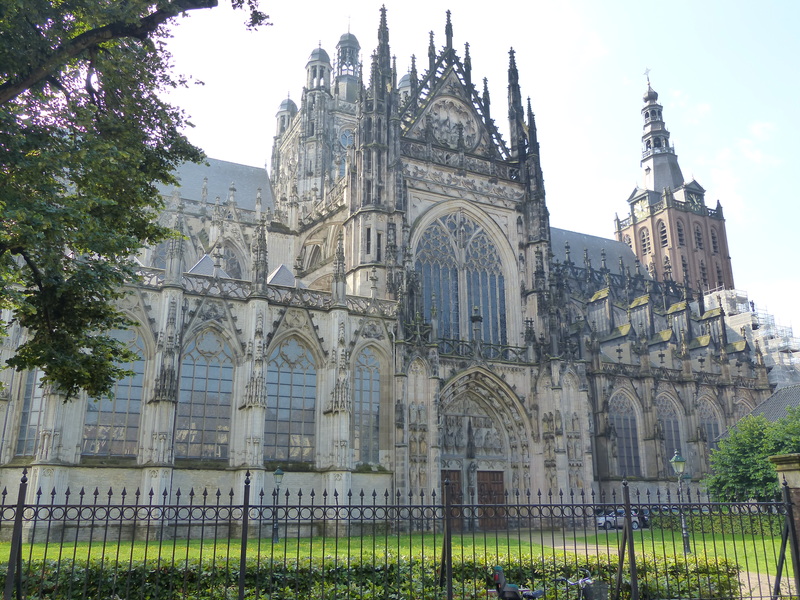 We said we weren’t sure, we were on our way to ’s-Hertogenbosch. “Yes, same place, I’m just use different language,” he explained, “I have just come from there, go this way,” he said, pointing to the lower path. We thanked him several times and he smiled and left us with a “Have a good tour.” Oh these friendly and delightful Dutch, we do love them! We took the suggested path and cruised along in the sunshine and warmth. The path took us into a small beach, with yachts on the water and a couple of families enjoying the warm weather, sitting and playing in the sand. 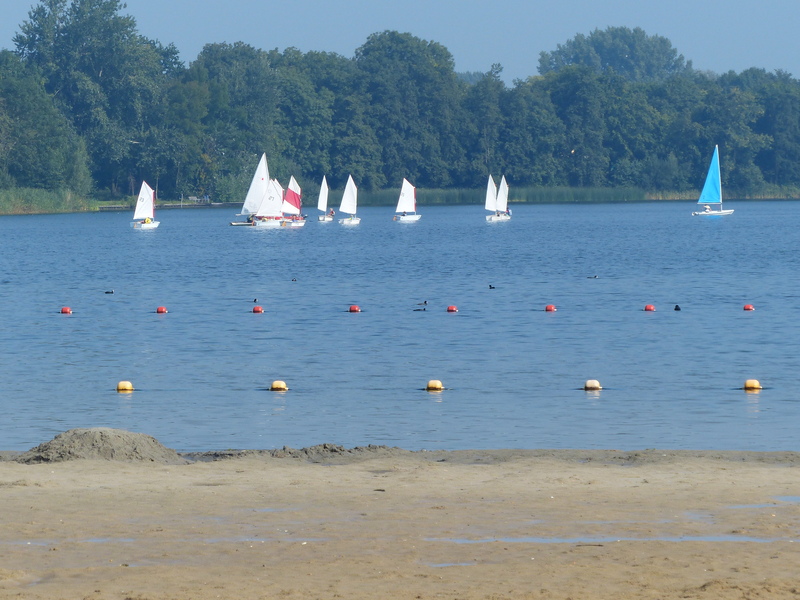 We stopped for elevenses in the sunshine, with the sand under our feet and watching the tranquil scene before us. 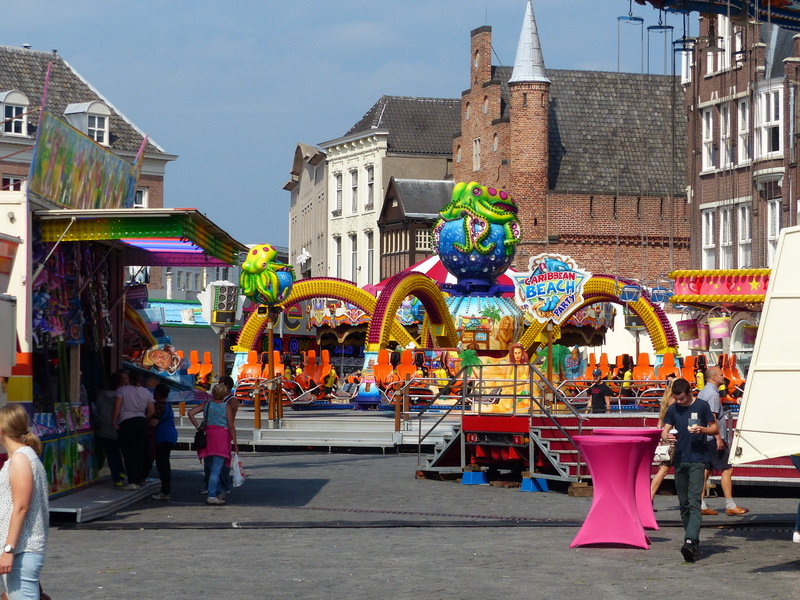 We continued on and rode into Den Bosch, where it seemed a fair was being set up. 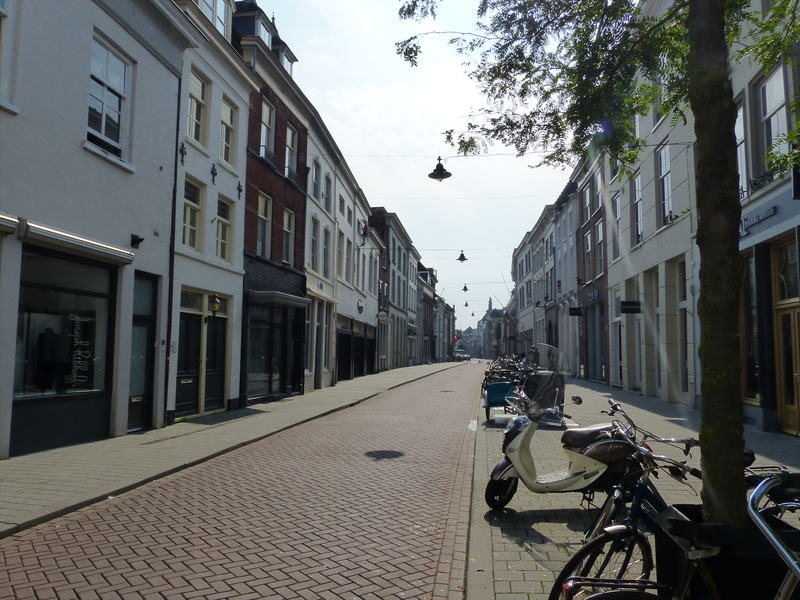 We rode around the streets and had a look at the town, then started to decide whether to ride on or stay for lunch. 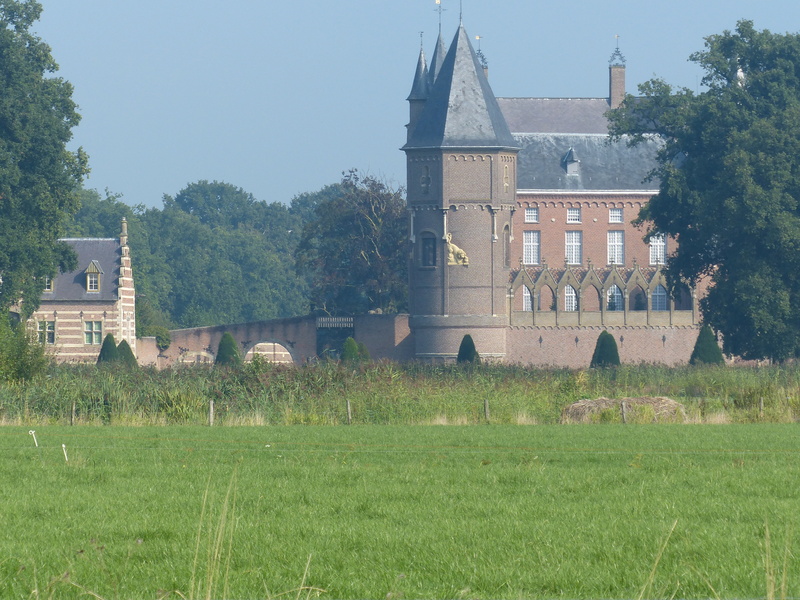 We were deciding whether to bring our Sunday lunch tradition with us to The Netherlands or not. Do we keep it going? 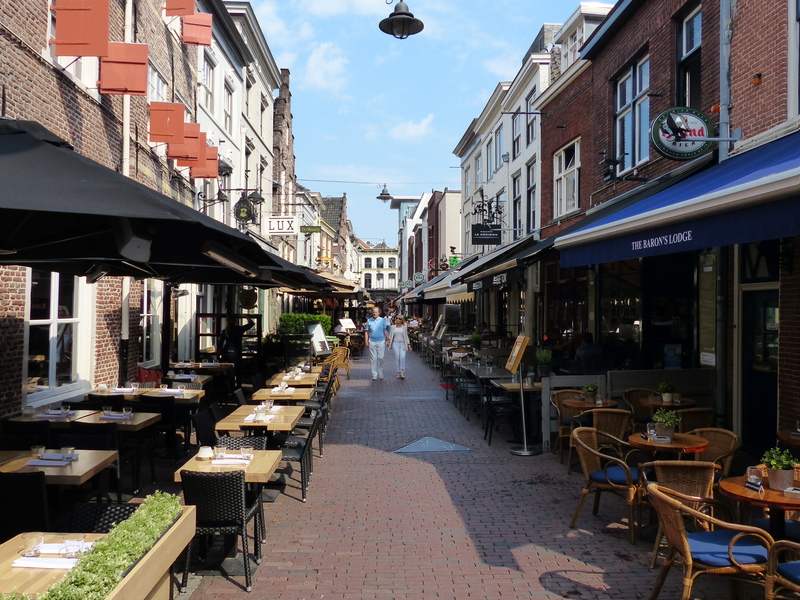 Do we tackle the challenge of navigating a Dutch menu? Yeah! Let’s do it! The tradition lives on. We found a place that wasn’t exactly a pub, but it was brasserie, so close enough and I read that it also had some veg options on the menu, so we thought we’d give it a go. We sat down at an outside table and started to peruse the menu. Yep, there were some words we knew and many, many, many words of which we hadn’t a clue! Once again, we had a very nice waitress who came to our aid and began translating the menu for us. I explained what I didn’t eat and she said it wouldn’t be a problem, they could do something for me. So in the end I ordered the Slim Sandwich with Humus / trostomaat / geroosterde paprika / avocado / pittenmix / geraspte oude kanas and I asked for it without the cheese (kaas) please and Steve went with a burger. Steve said his burger was “the best he’s ever had” and my sandwich was light and fresh and very tasty. 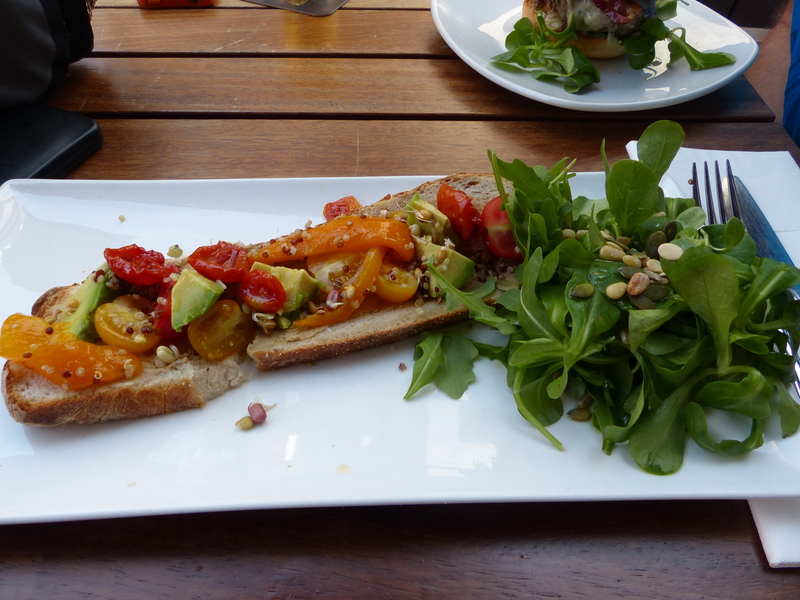 I was pleased I was able to communicate enough to have more than a leaf sandwich, which my bumbling and bungling communication skills had given me at our last eatery, and we were blessed again with friendly, helpful and delightful staff to help us along the way. Yes, that recently introduced sub-clause to our Sunday tradition was still in effect. This meant we could do a slower, shorter ride and not ride much at all after lunch. “It’s such a nice town, we could stay here,” suggested Steve. Yes, it was a nice town and there were some things we needed to get done, such as being in desperation territory in the laundry department. 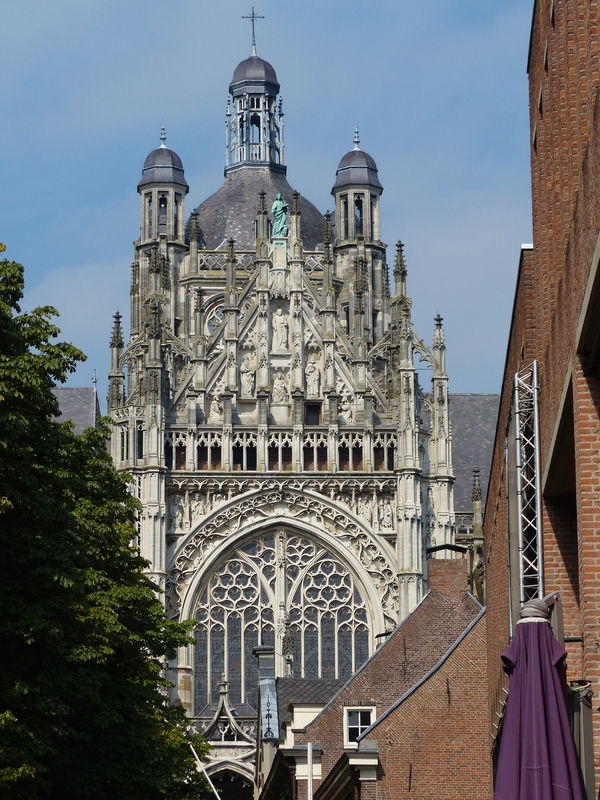 We also knew a lot of places were closed on Sundays, making the gathering of supplies more difficult, however we’d seen places open in Den Bosch, so we knew supplies were available if we stayed. Finally we made the decision, Go Slow Sunday had returned in its new Dutch guise and we would pull the pin after lunch and stay close to where we were, find solid walls to ride out the approaching storms and then race tomorrow when the worst of it has passed. With the decision made and bookings done, we relaxed with another beer for Steve and a cup of tea for me and enjoyed the beautiful day. “This is what every day should be like,” we said. 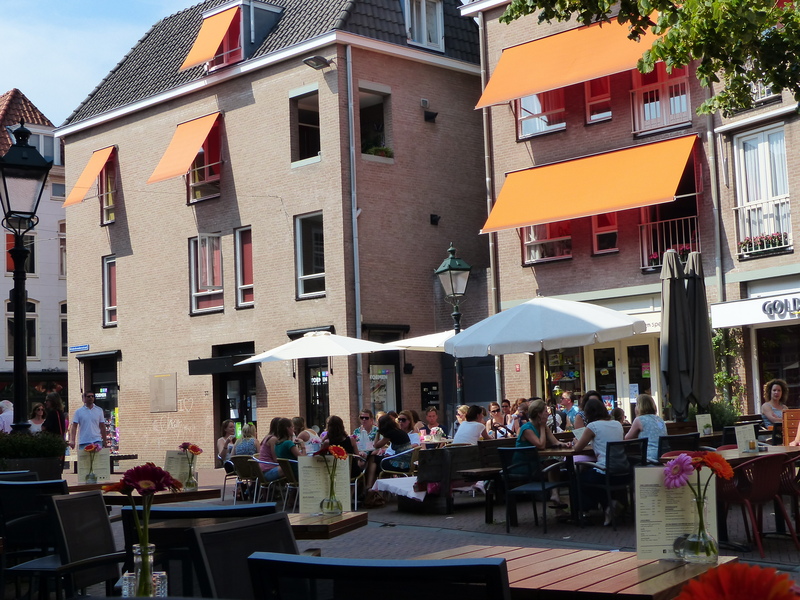 It was hot and calm and we were in a nice town, sitting, relaxing and watching the townsfolk go about their lives, taking in new scenes, new culture and simply “being”. 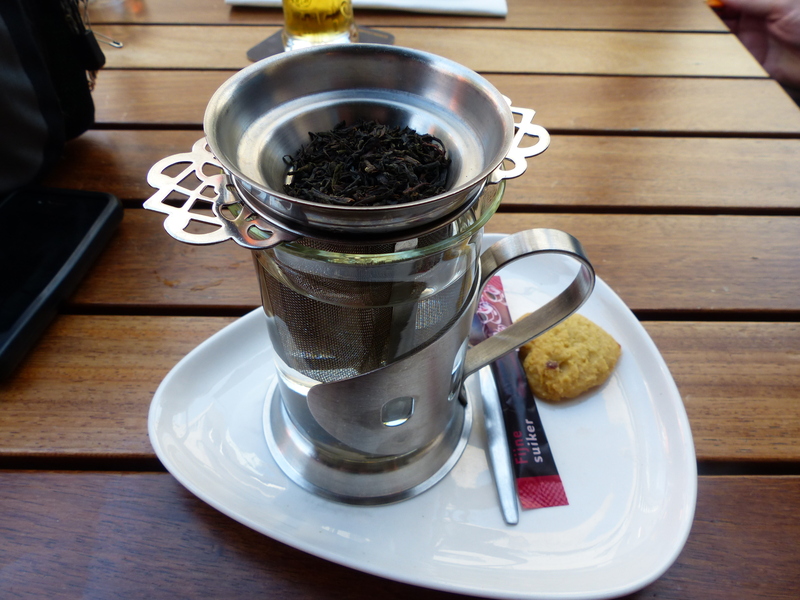 I have to say I love the way the Dutch do tea. Each time I’ve had tea at an eatery, it’s come out the same way – a cup with hot water, an infuser and the leaves on the side, so I can add as much as I want and brew it for as long as I like. Perfect! It’s also really interesting that milk is never mentioned. I’ve never had milk in my tea, but in England for example, milk with tea is a foregone conclusion, they just go together like peas and carrots or peanut butter and jam, they’re just the assumed combination. I always had to leave my milk, or give it back and even when I said no milk, I was always presented with a jug of it anyway, because I must surely have made a mistake with that request, how could anyone possibly have tea without milk! We’ll give it to you just the same, because you’re bound to change your mind or have really meant to ask for it! Here though, milk isn’t brought with the tea, nor is there any question or enquiry as to whether milk is required or desired. The tea is just brought as black tea. This is great for me, but I find it interesting that it’s made this way, so obviously the Dutch also drink black tea, no milk needed, so none offered or assumed it would be added. Very different from the neighbours across the water and I must say I favour the tea traditions here. 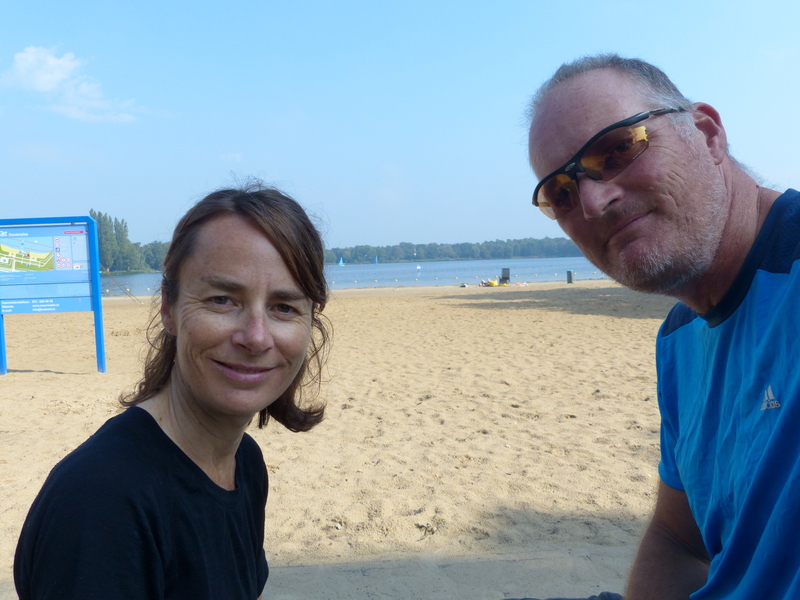 I like it when he reassures my worries, so I tried to give in to the sub-clause tradition and not feel guilty about a mere 21km ride and just enjoy where we were. I hope by the time this tour is over, I’ve left all my worry genes far behind somewhere! We settled in quickly then headed out for a roam around the town. 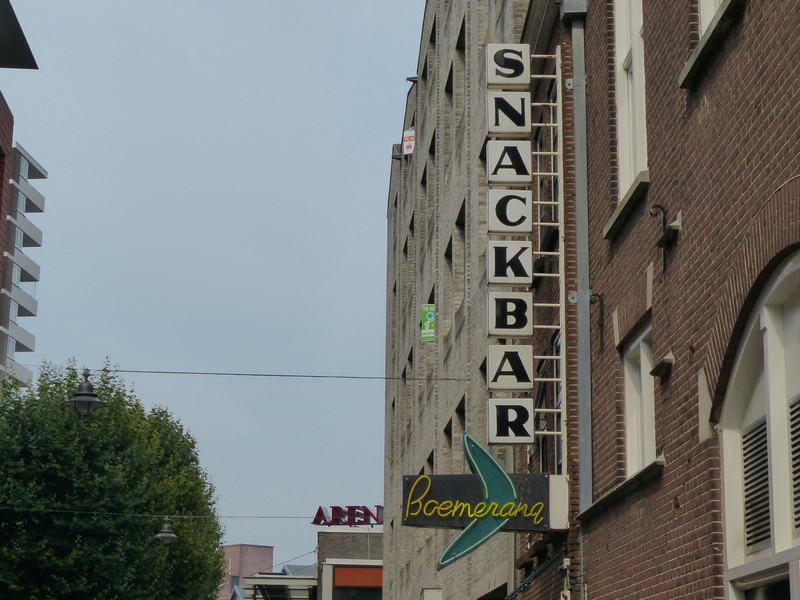 We saw a couple of reminders of home – the Australian Ice-Cream Shop and the Boomerang Snack Bar! We just love seeing all the people on bikes! Littlies, teenagers with boyfriend pedalling and girlfriend sitting on the back rack of the bike being dinked by her fella, parents with children, parents with toddlers and babies in seats behind the handlebars or seats on the back of the bike, septuagenarians, octogenarians, people with their big bags of shopping slung over their handlebars or stowed in panniers. It’s simply fabulous to see this kind of lifestyle. Everyone, of every age, shape and size are riding around the streets, with the bike being the prime mode of transport. It’s brilliant. 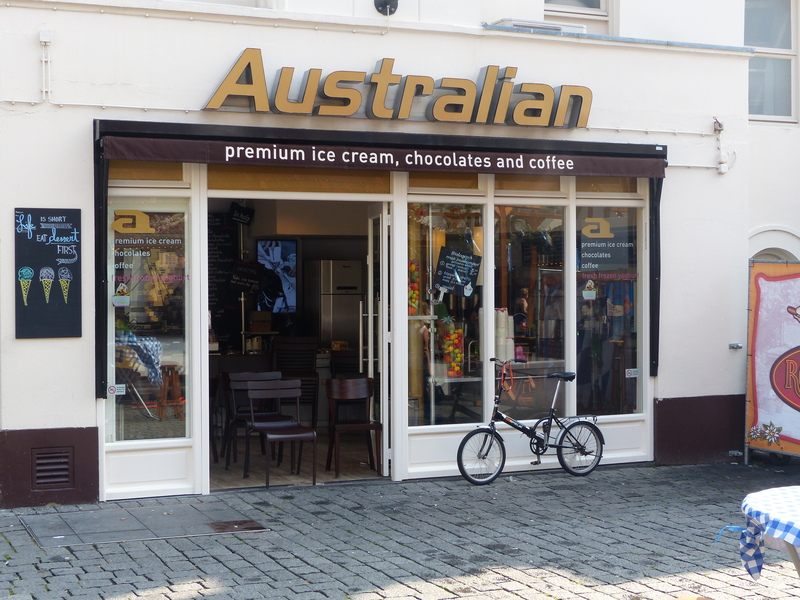 There are bike stands everywhere and bikes leaning against walls, along streets and beside shops and cafes all over the place. We can learn so much from so many of the places we’ve been, but I think this is the biggie that we could learn. Get some decent infrastructure in place and get people out of cars and onto feet and pedals. Make it easy. Make it something people would want to do or take for granted, because systems are in place to encourage it and enable it. That’s what we need more of. We have so many places in Tassie and beyond where this could happen, we just choose not to or we find excuses and it stays in the too hard basket. If the cycle routes, paths and lanes we’ve been using in Europe can be established with coordination between counties, provinces or even countries, surely a few local councils can get their act together to join up some of our cities and towns with walking and cycling friendly paths and lanes. Come on Tassie! We led the way with the ban of the plastic bag, let’s lead the way with people powered transport rather than engine powered everything. We can do it! 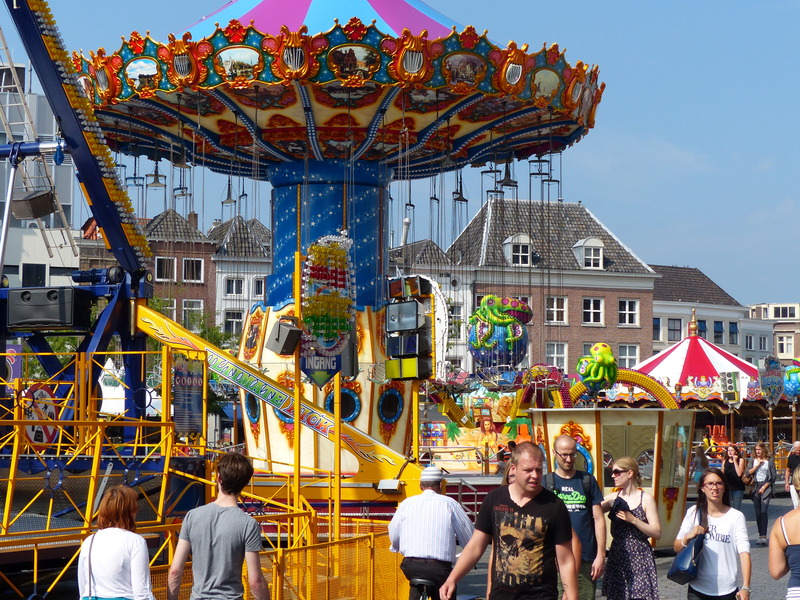 We enjoyed our stroll around the fair and the bustling streets, then headed to a supermarket for supplies, before getting some housekeeping done and finally doing all our washing at a nearby wasserette. All this was accomplished on a beautiful hot and sunny day, muggy after the morning storms, with interesting sights and scenes to behold and people to meet. T’riffic!